Happy Friday! It’s the end of May folks! Can you believe it? I sure can’t. I am not sure what is going on with me but I am such a weird week. I am feeling very meh and miserable. I am avoiding social media like the plague. I hope I snap out of it soon because I am now starting to annoy myself 😛 Anyway, on to the nails! 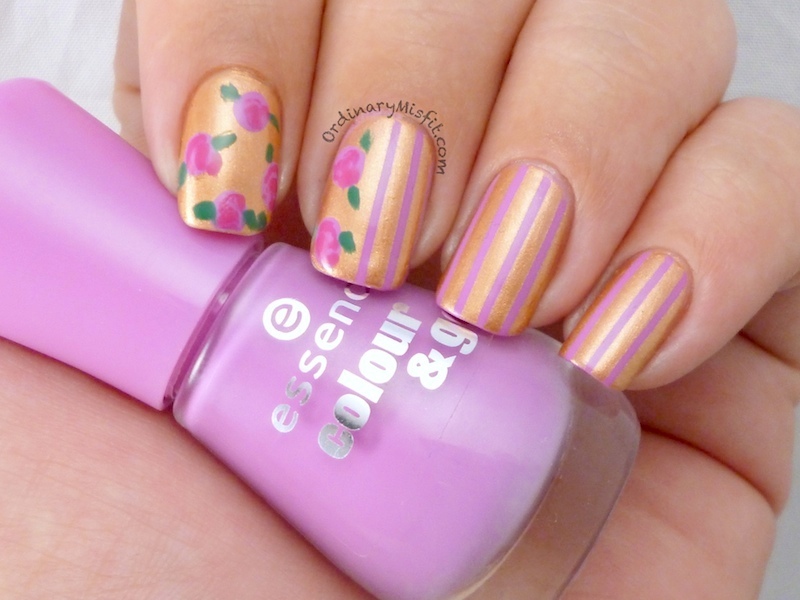 When I first saw Essence – Once upon a time it reminded me of bronzed baby shows and antiqued goodies. I immediately had this idea in my head and even though I don’t think my execution was perfect, it’s not too bad. Let me show you. I started with 2 coats of Essence – Purple sugar on my pinky, ring and middle and left that to dry. I then painted 2 coats of Essence – Once upon a time on my index and thumb. Once it was all completely dry I started with my striping tape. I did the whole nail on my pinky and ring fingers with striping tape and only half of my middle. 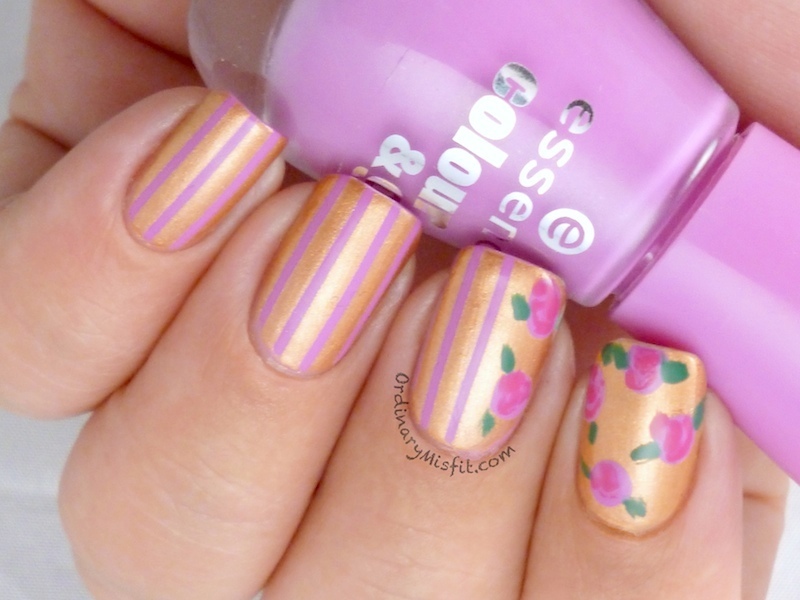 I then painted Essence – Once upon a time over it and removed the tape immediately. I then (tried) made the roses on my index using Essence – Purple sugar and Essence – Ultimate pink and made the leaves using Essence – The green and the grunge and a small brush. Topcoat and you’re done. I still really need Once Upon a Time! This looks amazing!!! I can’t believe the year is nearly half over, either. I like the color combo on this a lot and think you are being too hard on yourself about the roses. It’s absolutely insane. When did time fly so much!